I am 4 weeks into my UC Verde lawn test. The temperature in the San Fernando Valley has been peaking in the low 100’s this week so I’ve been especially vigilant about making sure the new grass plugs don’t dry out. Bred for the desert and hot climate areas, UC Verde is supposed to “thrive” in weather like this. The grass plugs are holding their own in this hot weather, something I would not expect from traditional fescues. I was advised by one of the UC Verde lawn experts who visited me last week that I should give each of the plugs a trim down to about 2 inches to stimulate growth. I did it. 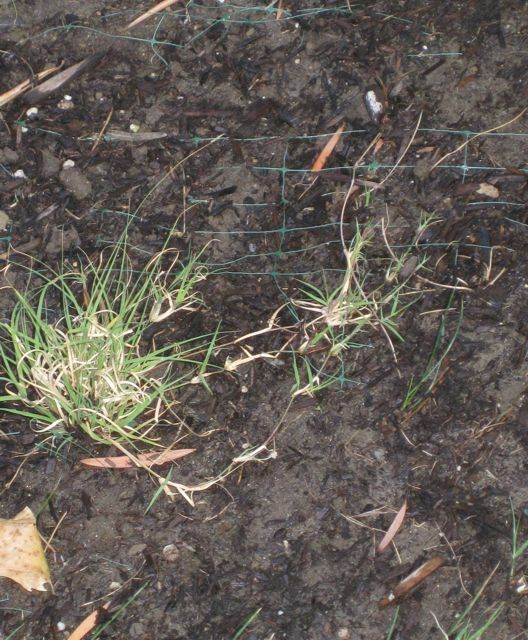 I made sure not to cut into the stolons that are running above ground since this is the way Buffalo grass spreads and knits into a lush lawn. Some weeds were starting to creep in so I applied some corn gluten, (an organic remedy for weed control) so I feel confident that the UC Verde lawn is getting all it needs to establish itself. The summer heat is sure to stimulate rampant growth and I’m looking forward to seeing a mass of green instead of small plugs. If UC Verde can thrive and perform well in my corner of Los Angeles where temperatures hit 110 degrees, I will become the UC Verde evangelist! about the softness of this grass: I have lived with buffalo grass in Iowa for several years. The texture is one of it’s best attributes. It is softer and finer than bluegrass. I’m a bit concerned the plugs were put in so close to the hot weather. The grass is heat and drought tolerants once established, but these plugs are not established, so this weather if going to be tough to start out in. They’ll need TLC. Thank you Wayne, I’ll look that up right now. My husband will be thrilled cause he’s been pulling up weeds in our bare spots for two summers now. We have a brand new lawn as of last year and nothing seems to be taking very well. To Anna. there is to much humidity in NC for UC Verde. Use Prestige turf-type Buffalograss instead. It with stands high humidity and temperatures from the low hundreds to single digets. I am curious what it would do in this mild climate of NC. Well..most of the time milder—It was super hot last year. But it wasn’t 110. You’ll be ready for our sometimes sweltering September heat when you come soon to the GWS–but just to throw you off–it could be cool. Don’t come to NC unless you study the weather first. Oh–and it might be super humid which would make 110 feel like 150. So if it says 85 with 70% humidity—you’ll melt. It’s soft and kid friendly, I love to walk in it, but it thrives in Phoenix. Maybe one of the other named buffalo grass varieties would work. UC Verde is the most heat loving and least humidity tolerant of the ones I researched. All of the varieties require full sun or at least 6 hours a day during the growing season – it’s a true prairie grass in that respect. We considered Carex, but the only place you can grow it here is in office courtyards and other sheltered places. I’m definitely going to keep following your blog and research. It’s a wealth of information. I did speak to the folks at U.C. Verde Buffalo grass . He said the grass is suited to the very hot inland areas of California and that my location on the beach would not be a good candidate. I appreciated his honesty . So now I am researching Carex pansa as an alternative. 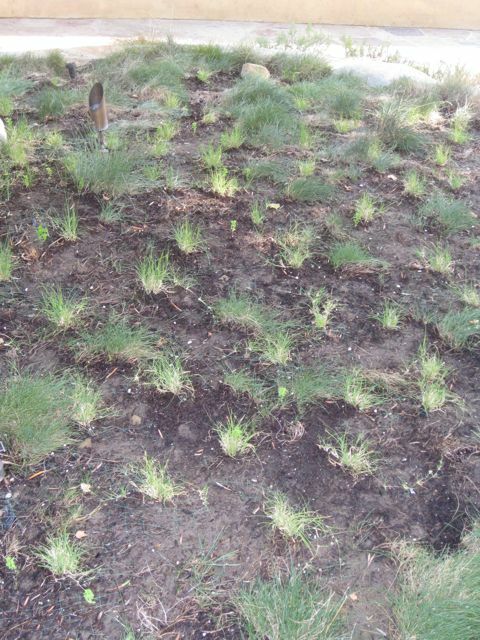 I will be planting a UC Verde lawn soon as well in Eagle Rock (North East Los Angeles). One question though, where are you getting your Corn Gluten from? i have been looking for a source in LA for some time now. Please let me know when you get a chance. thanks for visiting! I’m very anxious to see this lawn through establishment as then the year-round performance can be assessed. 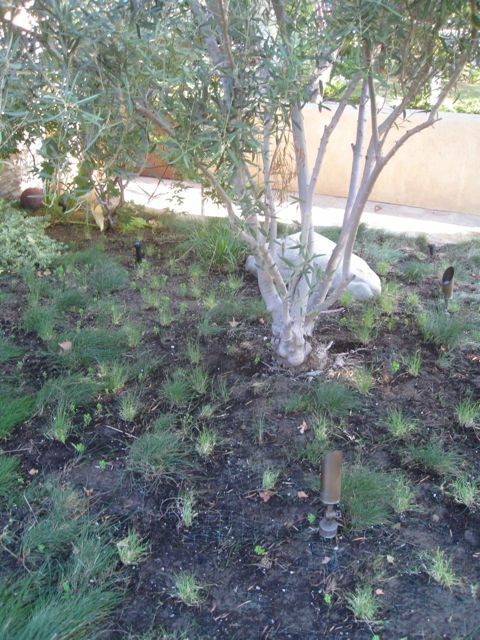 Have you tried any drought tolerant lawns in your area with success? Keep in touch, I’ll be following through this UC Verde test after establishment to make sure it is a year round performer. From what I have read and been told by those with UC Verde lawns, the grass is very soft and ideal for lounging just as much as a fescue. It is supposed to be kid and pet friendly. As far as the beach is concerned, I can only surmise that it performs optimally in dry desert areas- as it has been bred specifically for this. Thanks for visiting Michelle, love it when you drop in! I’ve been very inspired and interested in your research. I’m just starting to work on a new project out at the beach ( Marin County , just north of the Golden Gate bridge) and am interested in trying this grass out. Here’s a question : how soft is the grass ? My client would love to have the conventional softness of a kentucky blue grass turf but the economy and environmental attributes that the U.C. Verde buffalo grass. any thoughts on this ? Kid play friendly, directly on the beach ? I remember seeding an acre of lawn at this estate in Reno once when the day of seeding we hit the first days of over 100 degree weather. We used an orchard grass, thank goodness and it actually took. The man had his own well, so we could water 6 times a day, lol. The birds loved us! I am vitally interested in all the newer hybrids of drought-tolerant grasses. I think they will one day be the lawns in our futures. This is a terrific experiment. I agree. I hope I get enough growth before dormancy period. I’m off to check your progress now. I didn’t cut mine back or mow (much larger lawn area) and they spread anyway, but the first mowing did accelerate the runners. For hot-summer climates like yours and mine, It might be best to start as soon as you have temps warm enough to keep the grass out of dormancy so it’s better established and you have less bare dirt to keep moist when the oven turns on. Mine is tolerating 105-113 (has been for the past few weeks!) with watering every 4th day, compared to the every 3 days Bermuda needs to stay looking green. Good luck! It certainly looks healthy so far. I can’t believe your temperatures — UGH.